Is Opera for Android an 'off-road' champion? 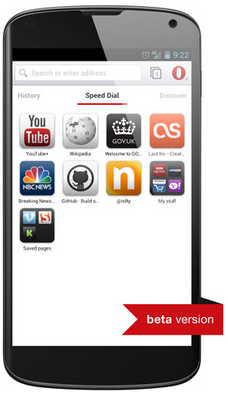 The Opera browser for Android is now out in beta version. The download is described as shipping with “sleeker and easier to use than ever” descriptive padding, which most of us can arguably take as read. What might set this mobile browser apart though is its off-road mode. The off-road mode is said to have integrated the “compression technology” from Opera Mini (the previous iteration for smartphones and PDAs of old) for faster browsing when conditions are rough. Rough off road mobile browsing conditions? By this terminology, Opera means when bad network connections exist or possibly when costly roaming charges exist while traveling. “Just switch to Off-Road mode and keep on surfing,” says Opera — and device trial reports have suggested that it is indeed possible to experience savings of around 80% in terms of data usage. So basically, off-road mode relies on server-side software engineering to render the browser’s functionality into what we can call a proxy-browser status (and this is similar to the way Opera Mini pulled off the same trick) and the result here is that Opera’s back end datacenter servers are tasked with shouldering more of the muscle when it comes to reading and ultimately delivering the web pages that the users wishes to view. After this back end workout, a distilled and somewhat reduced version of the web data in question can be delivered to the device – Opera would most likely call this “mobile optimisation”, but they’re a nice bunch so we’ll go light on the sarcasm. The firm is also now looking at integrating the Skyfire video compression technology (after purchasing the firm behind it earlier this year) into its total mobile browser universe as part of next stage developments. In the same vein, there is also “Save for Later” — This feature lets the user download a complete webpage and read it later while offline. “It’s perfect for reading long articles on flights without Wi-Fi or just when you don’t want to connect to the internet,” suggests Opera Software EVP of product development Rikard Gillemyr. You can get the new Opera browser for Android beta from Google Play or visit from Opera’s own website.